The Grammys announced this morning (January 13) more performers that will take the stage at this year's awards show on February 8th. Ed Sheeran, Ariana Grande, Eric Church and AC/DC will join Madonna as the only acts announced at this stage. Grande holds two nominations this year: best pop duo/group performance for "Bang Bang" (with Jessie J and Nicki Minaj), and best pop vocal album for My Everything. 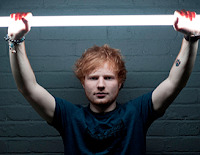 Sheeran has three noms: album of the year and best pop vocal album for x, and best song written for visual media for "I See Fire." Church is up for four awards this year: best country solo performance and best country song for "Give Me Back My Hometown," best country duo/group performance for "Raise 'Em Up" (with Keith Urban), and best country album for The Outsiders. The 2015 Grammy Awards will air on February 8th on CBS.